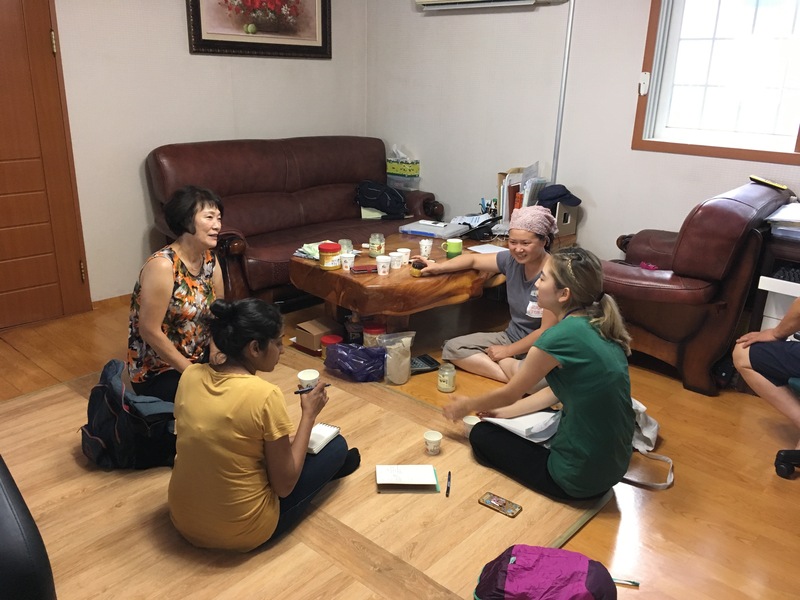 Every nook, corner and crevice in Ulleung-do contains valuable knowledge in abundance: forgotten paths with indigenous herbs, medicinal roots, trees, fruit, oils and much more. Any local resident in Sadong-3 ri is an expert in finding a particular kind of chinamul, pickling naturally grown fruit, raising the local breed of cow, building monorails along herb-rich paths, farming, and slow cooking amongst various other things. The people of Sadong all seem to be connected to nature through their places of work: farms, cowsheds, botanical gardens, workshops, trails known for wild herbs and much more. Ulleung-do has three invaluable strengths: its rich natural heritage, the people who know the secrets of this nature and the places through which they keep these secrets alive. However, these three spheres seem to be largely disconnected. The knowledge of the positive effects of the herbs, where to find them, their medicinal value, how to prepare and cook them are at risk of dying out because of an ageing population and an outmigration of younger blood towards the mainland. The people who do have valuable information and experience on these subjects are not in communication with other. Their farms, houses, sheds, gardens, parks and forests are each a treasure chest of potential that remain secluded from one another. The project proposes to create a network to connect these three individually-acting domains: nature, people and place, to make them one coherent whole. The invaluable knowledge that these domains contain is the biggest resource that Sadong can rely on for future development. Globally, there is a fast-rising trend to learn about natural products while living in the place that nurtures it. 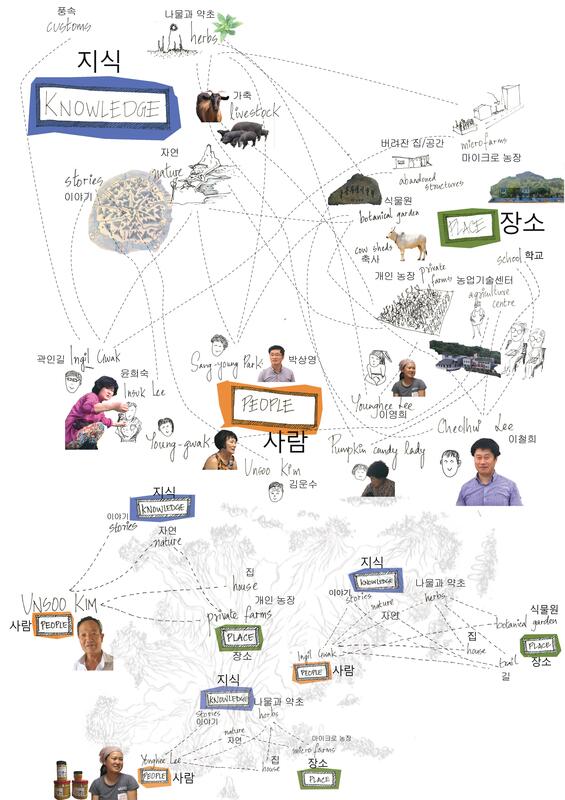 The idea is to make Ulleung- do the go-to destination to learn about indigenous flora, fauna, and culinary styles by working in farms, helping identify old trails, building monorails, researching medicinal properties of herbs and other projects that are direct requests from the locals who are a part of the network. Considering the rich landscape of Ulleung-do, the possibilities are endless. The local network could consist of all interested actors: farmers, builders, researchers at the botanical and agricultural centre etc. The actors could also simply offer their homes, farms, places of interest or identify those that could potentially be a part of the network. The target audience would be wide: people from the mainland interested in alternative studies, researchers in natural flora, internationals seeking a program in natural farming, longer-term tourists looking for alternative things to do on the island, etc. A common database will allow for people to identify which part of the network they want to be a part of allowing for a flexible program which could cater to many people’s interests. The way we imagine it, the knowledge transfer happens in an organic way, through both theoretical and practical means. We use the term ‘knowledge’ not only as that which can be acquired through certified training courses but also as an experience through seeing, touching and directly interacting with the network. During the workshop, we spoke to various residents each interacting with the nature in different ways. Mr. Young Kwang Lim is a passionate resident who repurposes natural wood waste to create sculptures, breeds pigs on his farm, builds terraces and viewpoints and constructs monorails. Ms. Younghee Lee is a slow-food specialist and grows a variety of herbs in her farm. She believes in organic farming and sells her naturally grown turmeric and ‘root’ on a small scale. Mr. Unsoo Lee is an old farmer who likes to talk to people and on farming techniques and opening his farm to outsiders who would be a part of the network. Mr. Sang young Park and Mr. Cheol hui Lee are officials of the agriculture centre and botanical garden in Sadong in which all of 600 kinds of indigenous plants in Ulleungdo grow. The centre holds education programs for farmers, such as a presentation for recent agricultural techniques. Also, It is now being remodeled to create a space for further social programs. They feel strongly that the nature in Sadong is its biggest asset which should be preserved and used carefully for further development. Ingil Gwak was born on Ulleung-do and knows many hidden paths in the mountains and the wild vegetables that grow in them. He feels a real necessity to preserve the knowledge of nature on the island. If we discovered anything, it was that the residents we spoke to were all enthusiastic about the idea of contributing parts of their daily lives and know-hows to a larger network that could benefit and enhance the source of their livelihoods. We imagine the project to bring the various residents of the island together with each other and with other actors who could help them in their livelihoods. This is very easily achievable by setting up a simple web page which lists all the interested residents and what their speciality is: farming, cooking, hiking, building, housing people, etc. People who sign up for the project pay a small fee to join the network which will be used to complement the resident’s income. The subscribed participants can choose an activity that matches their interests, will see a list of locals who practice it on the island and can get in touch with them to discuss further. If both sides agree, the participant will visit the island, ideally stay with one of the locals in the network, help and learn with the day to day livelihood of the local. A small team will have to oversee and manage the project having a base set up somewhere on the island. Imagine that a traveller from overseas wants to do something offbeat in Korea, signs up on the network and comes to the island to discover organic farming practices. Maybe an agricultural researcher is interested in the medicinal properties of the herbs in Ulleung-do and comes to the island to learn more from someone on the network, but also gives back to the island through his own research. Or maybe, as we saw during the workshop, chefs from the mainland want to get in touch with residents who specialise in the local cuisine and the network helps them find that connection. 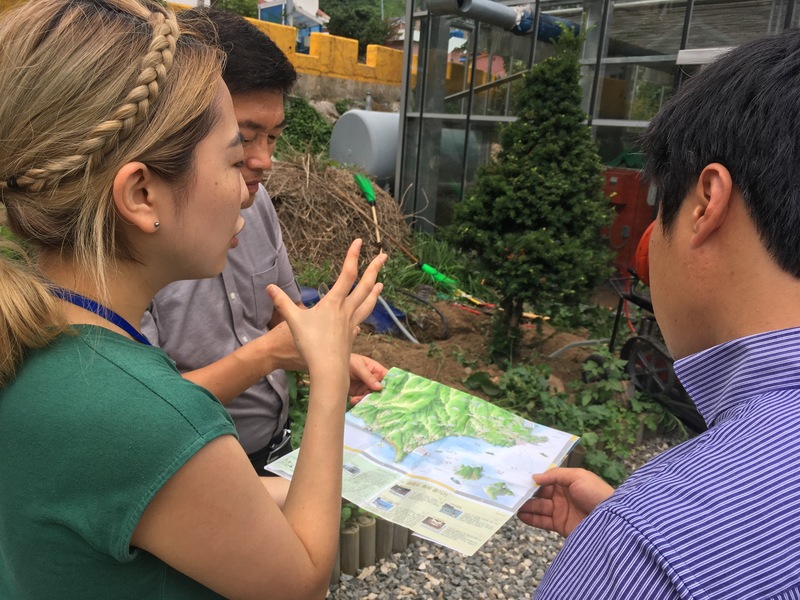 Once this initial network starts a dialogue and puts Ulleung-do on the map, the project could continue in many different ways like setting up certified training courses in rural agricultural practices. The Shinbisum workshop showed that Ulleung-do is a place where people of many professions find their interests in different parts of the island. The island unites so many different fields: agriculture, marine ecology, local cuisine, art, architecture, infrastructure. For us, it is in this bringing together all the different ideas, interests and skills, which is easily also economically viable for the locals, where the future of development in Ulleung-do lies. This project was conceived during the Shinbisum workshop by Seolha Lee, Leika Barthe and Manasvini Hariharan. Trekking through farms of herbs that grow on the island. Discussing the possibility of setting up base of the network with officials of the botanical garden.